On Sale Now! 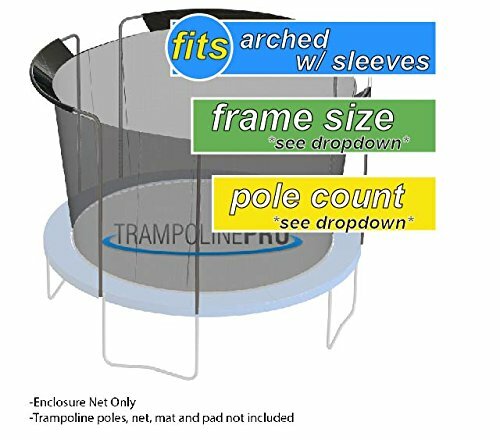 Save 10% on the Nets For Trampoline Enclosures | By Trampoline Pro | Select Your Pole Type | Select Your Size, Shape, and Number of Poles | NETS ONLY (Arched Poles (Sleeves), 15ft Frame - 3 Arches) by Trampoline Pro at Scruffs Game. MPN: 511502. Hurry! Limited time offer. Offer valid only while supplies last. This safety net is compatible with your Sports Power/ Bounce Pro trampoline and all trampolines with 12' frames and 2 arch-pole enclosure systems. This safety net is compatible with your Sports Power/ Bounce Pro trampoline and all trampolines with 12' frames and 2 arch-pole enclosure systems. Featuring high-quality PE material and an industrial-grade zipper, this enclosure net is specifically designed to provide long-lasting protection for your jumpers. New net style features a thicker mesh design that is much safer and higher-quality than previous replacement nets available on the market. Industrial-grade zipper detail allows for easy and secure entrance and exit. The Net does not include the springs within the enclosed jumping area. This provides a significantly safer jumping experience. Net attaches at the top of each arch pole with sleeves constructed with reinforced stitching. Net secures to the mat by weaving a rope in and out of the mat v-rings and specifically designed cut outs at the bottom of the net. Treated with UV protection, anti-bacterial, and anti-fungal protectants to protect your net from the elements. Order includes net, rope, and assembly instructions. Full 6 month manufacturer’s warranty.